I'm about to show you three of my favorite online songwriting resources (two of them are free)that you can use right away to take your songwriting to new heights. These resources have really helped me take my song writing to a new level. So I’m going to quickly take you through them one by one to give you a small preview of what they can do for you. The first online songwriting resource that I want to share with you is a website called soundsnap.com. Sound Snap is a library of really high quality sounds and loops. So when you go to sound snap you can do a search for a loop… for example if you need a drum track for your song, you could type in something like "rock drum loop", and when the results come up you can download the sample and use it. The great thing about SoundSnap is there is great variety, and the quality of the loops are very good and in most cases, professional level. So once you download a sample you like, how would you use it to improve your songs? Firstly you could use them in a production that you’re doing - a high quality recording. Another way to use them which I find really helpful is to inspire you in your song writing process. A little technique that I like to use is to bring the sample into a recording program and loop it over and over again so it lasts for 20 to 30 minutes. Once you have this set up, allow the loop to play through, and while this is happening, improvise on your chosen instrument… the idea is to freely improvise and don’t judge anything you do… as the sample stimulates your imagination, play these ideas and record them to a second track. The good thing about using a sample to stimulate ideas in this way is it’s going to impact the ideas that you come up with. For example, you’re going to come up with really different ideas, say if you use a rock drum loop as opposed to to a jazz drum loop. The backing track that you have there for yourself is going to change the ideas that you come up with. So that’s just a little technique you can use. It’s a really good idea generator. So that’s the first of three online songwriting resources. Check it out here - SoundSnap. I encourage you to visit the website and get in there and do some searches and I’m sure you’ll find some loops that you really like that you can use. 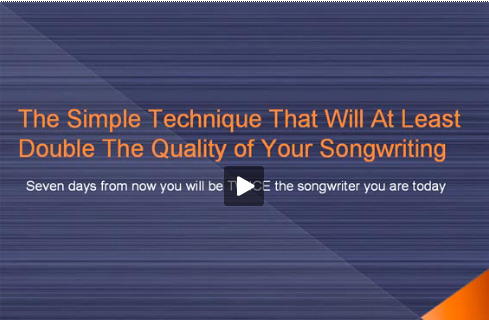 Click here to discover the second of three excellnt online songwriting resources. This one will be like nothing you've ever seen, I promise.